Facebook still reigns supreme in the social media world with billions of users logging in daily, and this continued popularity drives them to pursue and enhance the revenue opportunities within it to benefit businesses like you! Facebook's current targeting audience can focus on people who live in a particular country, state, demographic market area, city, and even a particular address. Facebook's newest ad targeting audience, yet to be announced, will change your Facebook marketing strategy for 2019: neighborhoods. As real estate agent facing the shifting industry, this means your Facebook ads can now be laser focused on residents in neighborhoods you most want to focus on in 2019. This innovative tool will change Facebook's real estate advertising, especially in larger metro areas where price fluctuations from street to street can be pronounced. As the industry-leading lead generation experts, CINC has already teamed up with Facebook to master the art of neighborhood targeting to best serve our clients. 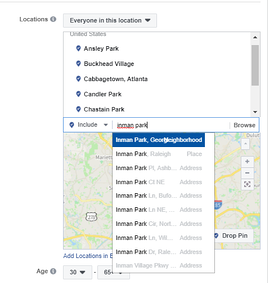 Now with Facebook's laser focus on targeting neighborhoods, we are getting your ads into the right neighborhoods and better defining the radius that meets your needs! 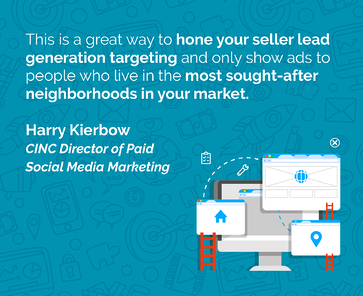 "This is a great way to hone your seller lead generation targeting and only show ads to people who live in the most sought-after neighborhoods in your market," says Harry Kierbow, CINC's Director of Paid Social Media Marketing. "We're always exploring the different ways to best utilize these Facebook targeting for our clients. For example, this neighborhood targeting could be used for move-up homes to buyers in your market, which would allow you to segment the targeting based on an average home price and potentially replace the home value targeting that was removed with the Partner Category update." While Facebook is a must-have in your marketing toolbox, it can be a daunting task to promote your business through the channel. Defining your goal objectives, targeting the ideal audience, and creating a strong CTA are all necessary to a successful Facebook campaign. It can be overwhelming and even if you feel strongly about your recently created Facebook ad, you could still fall short of your goals. CINC's Clients sit back and let CINC's Client Marketing do the heavy lifting to fill their pipeline. To the left, you'll get a glance at the behind-the-scenes look at what Facebook users will see when they look at the neighborhoods to target. Of course, there are a few details to be fine tune the feature. Want to learn more about CINC's innovation initiatives launching this 2019? Check out our latest webinar on our most compelling features launched!